Indulge Mom with a fantastic brunch or a springtime barbecue with great tasting recipes from the vast collection of favorites at RecipeTips.com. And don't forget to top off the day with her favorite sweet treat from our assortment of dessert recipes. 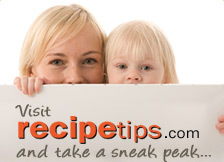 With guidance from RecipeTips.com, you can be sure that Mother's Day will be that extra special day that Mom deserves. A quick and easy one dish meal that can be served for a casual family brunch or is fancy enough to serve guests. Moist and full of pineapple and orange flavor, this is a perfect breakfast muffin. 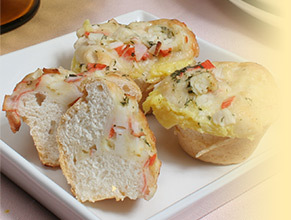 Crab and vegetables blended with mayonnaise and seasonings make this sandwich spread especially delicious. This inventive dessert recipe is a good choice for those special occasions when food preparation time is limited. Enter a Recipe for your chance to WIN an Infrared Gas Grill or an Oil-less Turkey Fryer from CharBroil®.